Nexus 4 KitKat OTA updates are starting! 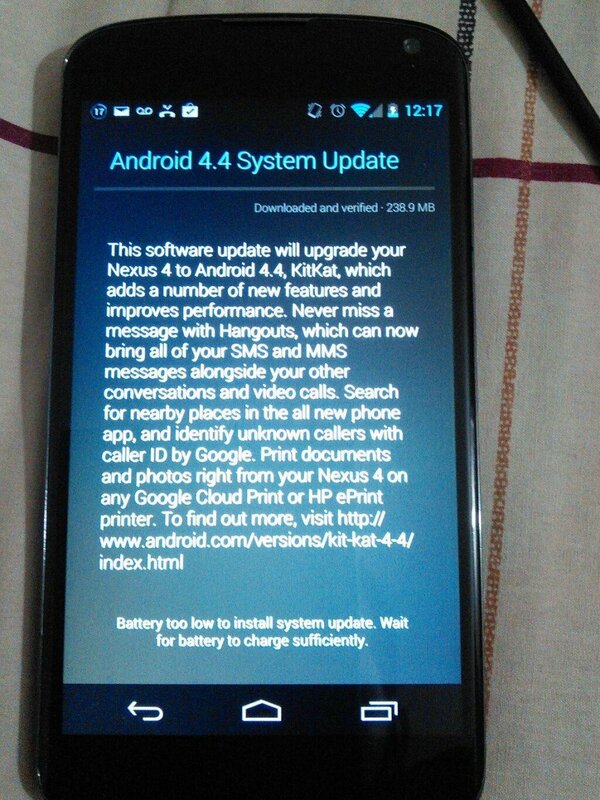 To end a busy day filled with updates in style, the Nexus 4 OTA to KitKat seems to have begun. We've seen several reports of users getting the new KRT16S build pushed to them this evening — which should end a lot of tension for fans. Seeing the new build lends credence to the opinion that Google didn't push out an OTA until they had the bugs properly squashed. We have to agree. Also worth noting that these reports come from folks who didn't sideload the factory image earlier in the week. We're digging for the URL so everyone can join in. Once we find it, we'll be sure to post it here. Update 11/21: You can get the OTA URLs here.